​New lesson plan ideas are welcome. See below for instructions on submitting. Students observe an aquarium--either a drawing of one or a classroom aquarium--and discuss the question "What is an ecosystem?" A hands-on activity is making diagrams of food chains observed in aquariums. Students might discuss the aquariums they saw at the Belle Isle Aquarium on a field trip. Fifth Grade Science. Students learn the components of a good story, analyze these parts in a short video, then work on creating video stories of their own. Story topics in the lesson are about environmental problems of invasive species and plastics. Cross-curricular, between language arts and science at fifth to eighth grade level. Includes invasive species background information, vocabulary, slides in PDF format, and a "create your own" invasive species activity. Fifth grade science. ​Activity matches different invasive species cards with their means of introduction and places where they came from. Includes "how to stop them" breakout group activity. Grades 5 & 6. Potentially useful for other grades. This lesson plan explores how zebra mussels and quagga mussels have changed food webs in the Great Lakes by filtering plankton from the lakes. It includes a hands-on activity that demonstrates how mucus produced by the mussels may bind the floating plankton to concentrate it on the bottom of the lakes. For Grades 5 and 6 science. Are Mussels on a Zebra Dangerous? Includes a Q & A activity in which the teacher shares the experience of having participated in collecting quagga mussels from the Detroit River (contact Jeff Ram [jeffram(at)wayne.edu] at Wayne State University about a teacher PD in which this occurs. Includes map-reading about the spread of these mussels. Students also watch a video about these invaders. For Grade 5 Science. Students explore the meaning of food webs and how invasive species like the sea lamprey have changed them. Hands-on activities include using "species cards" of Great Lakes and non-native organisms to create and modify food webs. For Middle School and High School students. Students read and watch a video about zebra mussels and learn ways that scientist are combating other invasive species. 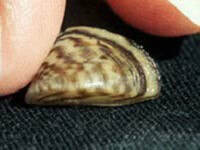 Students brainstorm properties of zebra mussels that might make them vulnerable to being "caught" by a trap. Students then "save our ecosystem" by imaginatively designing a way to catch and destroy these Great Lakes invaders. Designed for Grade 5 science. Starting with a photo of two sea lamprey on a brown trout, students discover what invasive species are, why they are harmful, and what species are found in Michigan. Through small group and whole group discussions, including the technique of "sticky note observations and a gallery walk" students will ask questions and define problems associated with invasive species. Grade 5 invasive species lesson. Preventing the Spread of Invasive Species in Michigan Through Infomercials! Students begin their discussion of invasive species with photos of native cattails and invasive phragmites. After learning about the sources and harm caused by invasive species, students will then research a Michigan invasive species and communicate their ideas about how to remove or prevent it from spreading by writing a script for an infomercial, recording it, and learning about many invaders by watching each other's infomercials. ​For 4th grade science. This lesson focuses on the role of earthworms in food webs and the devastating effect invasive earthworms are having on some forest ecosystems in the United States. Students study potential similar impacts in the Great Lakes region and how people can slow the spread. Students will learn about earthworm species, why they can be considered invasive, and do a lab to collect earthworms around the school as part of a place-based learning experience. ​For middle school science, grades 6 - 8. This lesson focuses on the effect of invasive species in the Lake Huron Food Web. They will identify the invaders as producers, consumers, decomposers or scavengers and investigate how the food web could potentially change as a result of the invasive species. ​For middle school science, grades 6 - 8. ​Let Me Tell You About Plants! Students learn about the problems caused by introducing invasive plants into our ecosystem and use their knowledge to develop displays and brochures to educate the community about using native ornamental plants instead of non-native, potentially invasive ones. This is a cross-curricular lesson plan, potentially usable K - 5th grade, covering ELA, science, and social studies standards. Students work in groups to research an invasive species found, restricted, or prohibited in the State of Michigan. After researching various invasive species through State of Michigan and other websites, students will discover various solutions to control or prevent invasive species. Students then reinforce their understanding by working in groups to develop projects to spread awareness about species that are a danger to the Michigan environment. ​Grade 5 science. Provides an overview about invasive species and the damage they cause to Michigan’s eco-systems and the Great Lakes. Students will have the opportunity to research a specific invasive species, and then write a short report and build a model to display their findings. Grade 5 Science. Students explore the reproductive methods of both invasive plant and animal species through a combination of dissection and reading. They will then apply this knowledge toward the inhabitants of a local park or nature center to determine how successful each species is at reproduction. Grades 7 and 8 Science. This lesson places an emphasis on how to manage and control the spread of invasive plants in Michigan. Can be taught as a traditional class, or as a flipped class in which a student guides the discussion/lesson. Grades 9th through 12th. Students learn the difference between native, non-native, and invasive species. They then learn to apply these labels to different aquatic creatures. This lesson will also introduce students to research by having them analyze articles to create a presentation on invasive species. Grades 6th through 12th. New lesson plan ideas are welcome and will be uploaded as they are received and approved.